Energy Services Companies (ESCO) project is designed to develop energy efficiency services in public procurement of Ukraine, implementing a set of innovative Open Data tools. It was developed by Quintagroup in cooperation with EBRD Energy Efficiency Unit. Energy Services Contracts (ESCO) project, developed by Quintagroup in cooperation with EBRD Energy Efficiency Unit and commenced in 2016, is designed to develop energy efficiency services in public procurement of Ukraine, implementing a set of innovative Open Data tools. 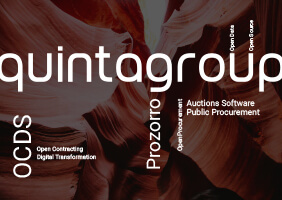 Energy Services Contracts mechanism is functioning within the Prozorro electronic public procurement system and is realized with OpenProcurement system, an open source e-procurement toolkit developed by Quintagroup. Energy Services Contracts mechanism offers an ability to combine the interests of the customers and providers of energy saving activities. 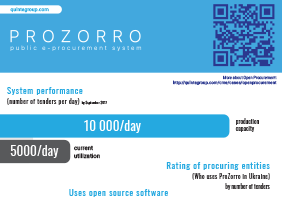 The most significant modification in tendering process, in comparison with other Prozorro eprocurement procedures, is that of the awarding criteria. While previously implemented procedures regard the lowest cost, suggested by an energy service company during auction, as the defining criteria, for ESCO tenders it is the energy service contract performance indicator. This indicator is automatically calculated with the NPV formula (net present value), elaborated in conjunction with the EBRD. Tender winners will renovate heating systems or heat insulation at the expense of investors. Therefore, energy sources costs may be reduced, usually at least for 20%, and a loan may be serviced with the saved money. Thus, ESCO project is aimed at increasing the visibility of energy efficiency horizontal policy in national public procurement processes and better transparency and better insights into efficiency of public procurement. 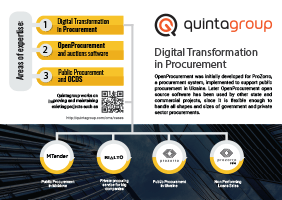 The OpenProcurement toolkit encompasses a Central database (CDB) and an API, which API guarantees interactions between web platforms and CDB. Commercial web platforms cater for access for procuring entities, suppliers and regular visitors and interact with the CDB via OpenProcurement API, web interface based on the JSON notation, and provide suppliers with temporary credentials to access the Auction module for participation in the auction. The toolkit implementing the OpenProcurement API has been developed using powerful open source web technologies such as Python, Pyramid, AngularJS, Bootstrap, Flask, CouchDB, and PouchDB to ensure reliable functionality and secure workflow.